If you wonder why London – like many other UK cities – increasingly resembles an SUV car park, you can blame BMW. The X5, of almost 20 years ago, was the first 4x4 that drove like a normal car. Suddenly, you could buy a 4x4 – more versatility, more go-anywhere appeal, an elevated driving position – that didn’t drive like a truck. It sold way beyond BMW’s modest ambitions. Remember, too, that at the time BMW knew a thing or two about 4x4s: it owned Land Rover. Competitors copied. Even Land Rover, the 4x4 daddy, changed its SUV recipe: subsequent models became much tidier handlers, and far more road biased (and far more successful). Audi and Mercedes, initially SUV laggards, both jumped on this increasingly profitable gravy train. Other Xs followed: now we have X1, X2, X3, X4, X5, X6 and, soon, an X7. We even have M versions, just to show how well these surprisingly agile demi-trucks have adapted, Darwin-like, to the tarmac. Xs now constitute 34 per cent of BMW global sales worldwide, and growing. Now almost every maker has road-biased SUVs that drive (almost) as well as proper cars, never mind the extra bulk and invariably extra thirst. They have morphed from minority to mainstream. If I look out of my London window just now, four out of 10 cars I see parked in my narrow urban street are SUVs. The original X5 engineers, or old Land Rover folk, just wouldn’t have believed this level of popularity. The best-selling version of the X3 will be the 2.0-litre diesel – 20d in BMW-speak. Here we test it on- and off-road, in its top-selling M Sport trim. It’s a better car, as we shall see. But a pricier one, too. In M Sport guise, it’s £41,380, almost £2000 more than the old one. The entry-level model’s price is inflated by more than £3000, or almost 10%. The third generation of X3 (in 14 years) looks very much like its predecessor (and much better than the original ugly duckling). In fact, it’s all-new, apart from – most significantly – the familiar 2.0-litre turbodiesel four-cylinder engine, of unchanged power and proportions. Its underpinnings are based on the fine new 5-series, and so are many of its cabin fittings. We find a car slightly longer overall (by 51mm – mostly in the wheelbase), 10mm wider, and pleasingly lighter (up to 55kg, depending on spec and model). Keen eyes may spot its broader front light clusters, bigger kidney grille (complete with vents that can close automatically to help aerodynamics) and more sloping glass house. Its shoulder line is more horizontal, the rear window wider, the back haunches more muscular. That smoother style helps aero: Cd is down from 0.36 to 0.29. It’s still chunky, more eye pleasing (if not exactly a beauty), and looks more hunkered down to the road. Interior space is a touch more generous and the boot size the same, though its simple square shape makes the luggage area more usable. The rear seats fold 40: 20: 40, and they can go (almost) flat. The rear back rests are also rake adjustable, helping both rear comfort and load capacity. The biggest improvement to the interior is its quality. Using the new 5-series as a donor vehicle greatly helps. The design is still a touch too busy for my tastes. 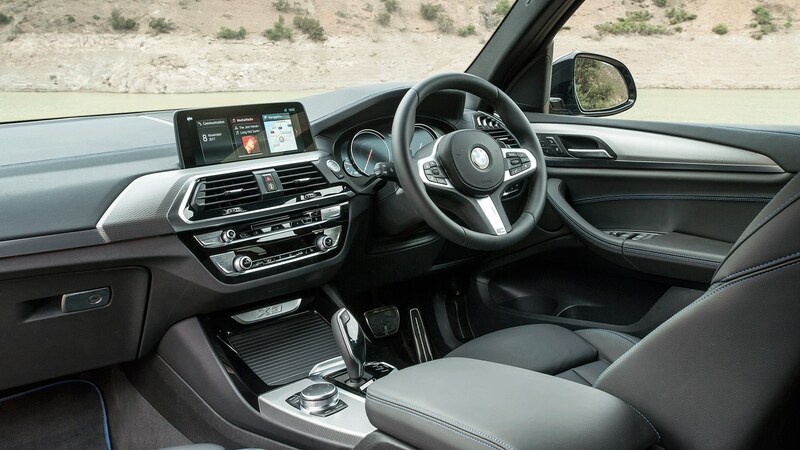 But the quality of the wood, leather, alloy trim and plastics are excellent (unlike the old X3) – both to the eye and to touch. It’s a classy environment, and a high-tech one, too, complete with niceties such as a bigger head-up display, gesture control (an option) and many semi-autonomous driving functions including active cruise control that can brake and accelerate in low-speed stop-go traffic, steering lane control assist and auto city braking. Amazon’s Echo Alexa voice control also allows you to check fuel level, change heating and ventilation, and lock the vehicle, all by remote using your smartphone. Order the panoramic sunroof (25cm longer than before) and the X3’s cabin becomes an even more pleasant place to spend time. I also like the ‘light carpet’ – BMW speak for a small spotlight behind the front wheel which illuminates entry and exit, and works rather better than conventional under-door ‘puddle lights’, casting a nicer light spread. Okay, but does it drive like a BMW should? The 5-series platform helps serve up the sportiest driving experience in the class, excluding the sharper, faster, pricier (but less spacious) Macan. Unlike most rivals, handling feels rear-drive biased: no surprise, as the 4x4 xDrive system usually parcels more torque rearwards, as it magically varies front-rear split depending on traction needs. Steering is unusually precise for a chunky 4x4, and body roll well checked by the M Sport suspension. Ride is firm, but not uncomfortable. The 188bhp engine is brisk, if not punchy: 0-62 of just 8.0 seconds means no extra performance is needed. Mind you, sample the 3.0-litre straight-six 30d – an extra £5800 – and you will want the meatier, smoother and bigger unit. So the X3 20d is good to drive, although it doesn’t reward like a good sports saloon on winding roads (of which there were plenty, during our two-day test in Morocco). It doesn't engage as richly, nor is it as throttle responsive or the steering as playful. If driving fun is a priority, order the cheaper 320d xDrive M Sport Touring or the slightly pricier 520d, and smile. Inside, we find a spacious and light (especially with panoramic roof) cabin. There’s generous rear space for two six-footers – three at a shoulder-to-shoulder pinch. Why buy a next-size up X5? Seat comfort is excellent, and it's a very quiet cockpit too, helped by double glazed screens and front windows. In fuel economy, its 132g/km CO2/56.5mpg figure is near class best, and almost identical to the same-money similar-performing Audi Q5 and Benz GLC. The equivalent Disco Sport is a touch thirstier and slower. And can this soft-roader go off-road? Unusually for a ‘soft roader’, our test took place on a challenging off-road route that included just over half a day sand-surfing and rock-climbing, not to mention many miles on stone-strewn desert tracks, all deep in the Moroccan Sahara. Tyres were standard Pirelli P7s (on 20 inch wheels). The car performed astonishingly well, I thought. 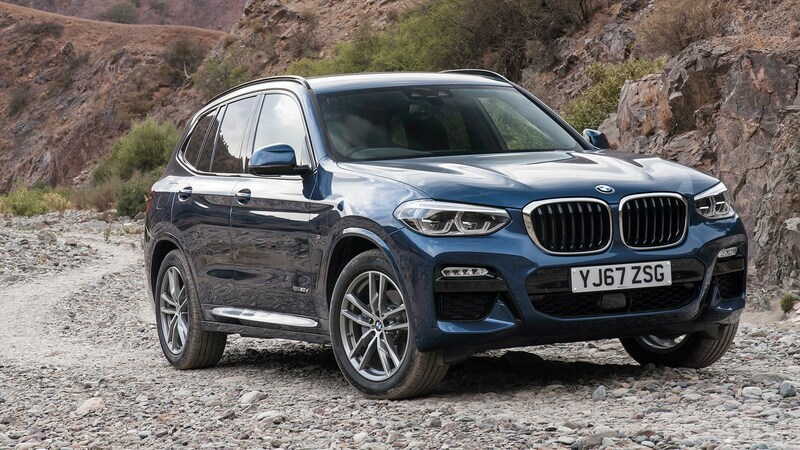 The xDrive 4x4 system – now standard on all X3s– offers excellent traction and can certainly boldly go where no conventional two-wheel-drive saloon would dare tread. Only its limited ground clearance, and modest wheel articulation, prevents Land Rover-style adventure. Put it this way, you’ll have no trouble clambering up your cobblestone driveway in Surrey in a frost. 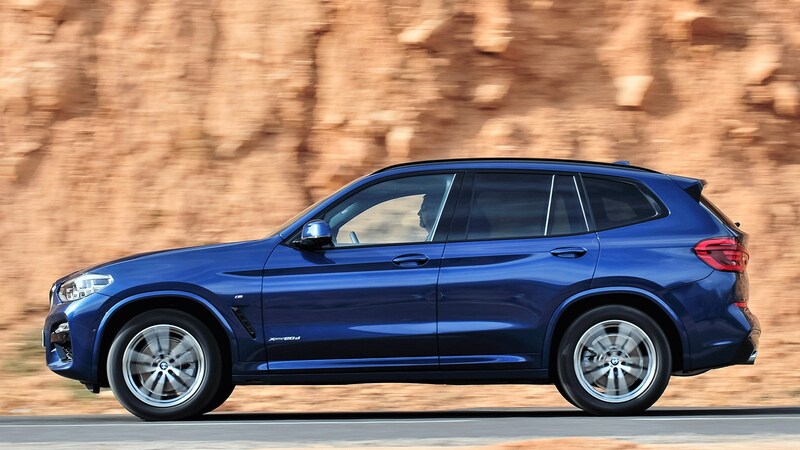 The X3 is a fine mid-size SUV that mingles driver appeal and practicality. Wealthier drivers should spend a bit more and choose the 30d – or go the whole hog and get the fine new M40i. Keener BMW drivers may also consider saving on mass and money, and buy a 320d xDrive M Sport Touring (or even better, a 520d xDrive M Sport Touring – a mere £3000 more). 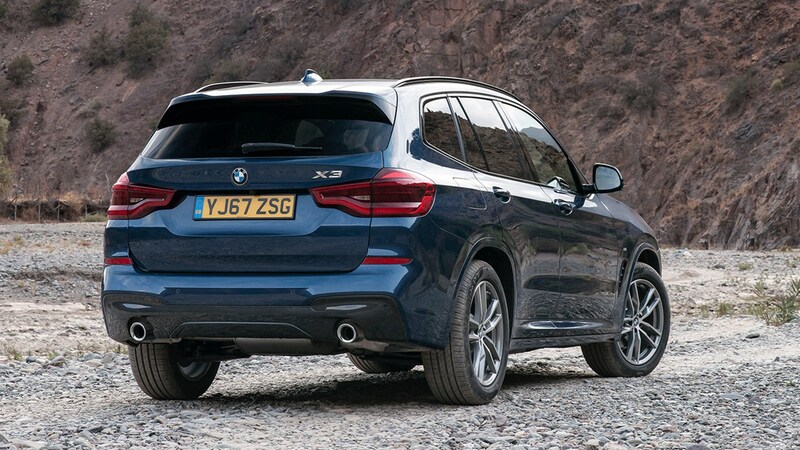 But for those who want an SUV, and want one that’s good to drive and offers great practicality – and more off-roading ability than you’ll ever need –the new X3 is a fine choice.